Have you met the denizens of Grace’s diner? What? You haven’t? Either on stage or in the movie? Or on television’s HBO a while back? Well, here’s your chance to catch up with a bunch of strangers learning about love in Dio’s production of William Inge’s Bus Stop (1955). 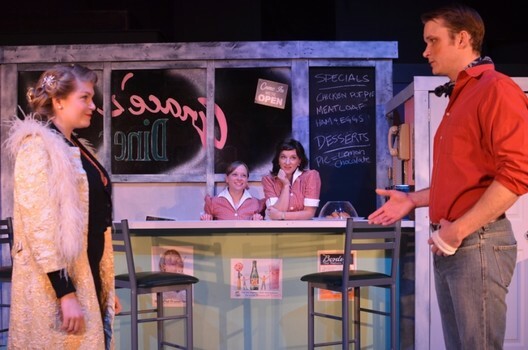 First, there’s spunky and love-starved Grace, played beautifully by Amy Morrisey — and her fellow waitress, high school straight-A student but naive-in-love Elma (Jacklynn Cherry). Andrew Gorney plays a level-headed and superb Sheriff Will Masters. What follows is a mix of humor, drama, and who-will-end-up-with-whom storytelling as only William Inge could have written…with a scrumptious chocolate mousse cake that arrives at your table during intermission created by chef Jarod just in time as you have been listening to all that talk about donuts, pies, burgers, and coffee. The pre-show meal is delicious as always, and features his yummy fried chicken, shepherd’s pie, and fruits and vegetables.